MIAMI–(BUSINESS WIRE)–Unified Video Technologies (UNIV), specialists in developing, integrating and operating complete high-performance media and broadcast ecosystems for broadcasters and enterprises, announced that it has completed the first phase of the analog-to-HD digital upgrade of ZNS TV-13, a network owned and operated by the Broadcasting Corporation of the Bahamas. 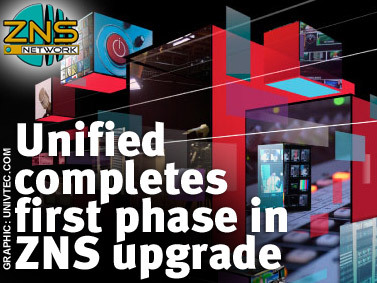 The new ZNS network facilities and software-based workflows, together with employee training programs designed and implemented by UNIV, have modernized ZNS operations and services and positioned the broadcaster to provide world-class media services to all the residents of the Bahamas. The new systems also make it easier for local writers, producers, directors and actors to create content for ZNS. UNIV designed the custom end-to-end solution based on unique ZNS requirements, including the geography of the Bahamas, which comprises 700 islands scattered over 180,000 square miles of the Atlantic Ocean. Using its customer-centric, brand-agnostic approach, UNIV implemented an end-to-end solution for ZNS that integrates best-of-class systems and delivers superior and cost-effective performance. UNIV also collaborated with a leading studio design firm to create state-of-the-art newsrooms with energy efficient lighting grids, and with world-renowned station branding experts to rebrand ZNS and integrate branding elements in the workflow. “At UNIV, we feel privileged to have the opportunity to provide ZNS with solutions that improve the day-to-day viewing experience of millions of the residents of the Bahamas,” said Pablo Goldstein, CEO of UNIV. “We are happy that we were able to create a cost-effective end-to-end solution that empowers ZNS to create innovative content, replaces burdensome processing, manual content management and archiving with an automated workflow, and frees staff to focus on the viewers’ needs,” concluded Ariel Matzkin, UNIV’s CTO. Speaking in Parliament at the end of last week, Prime Minister Perry Christie has said that the government is looking to cut costs across a variety of departments.